Our discovery of hidden springs revealed some magical moments. Thanks to everyone who attended! 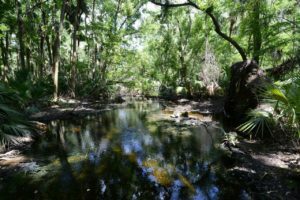 On June 3, about 30 participants in the Friends of the Wekiva River’s sixth and final ecology field course trekked across Seminole State Forest in search of “hidden springs”. These diminutive, Magnitude 4 or 5 springs still emanate from relatively unaltered natural lands and provide much of the surface flow for Sulfur Run, a tributary to Blackwater Creek. All these springs occur in the Wekiva basin springshed and are protected within the 25,000-acre Seminole State Forest in the Wekiva to Ocala corridor. On the Forest, management is focused on restoring the historical biological diversity of scrub and sandhill habitats. Preservation of these habitats, characterized by extremely high recharge into the Floridan aquifer, has also protected the springshed for the springs that we visited during our day in the field. The springs occur in an area referred to as Sulfur Island, a 60-foot uprising of well-drained soils underlain by limestone. At the spring vents, groundwater is forced out of these karst formations by underground pressure. The springs bubble up at the surface and form a continuous flow of clear, low nutrient water. We visited Helene, Markee, Boulder, Shark Tooth and Palm Springs. Palm Springs was dammed by previous private landowners to provide a deeper swimming hole. After acquisition, the state removed the dam to return the spring to its natural topography and hydrology. We admired the success of these restoration efforts, and the recovery of native vegetation along the slopes of the spring. Helene Springs sits in a veritable oasis of hydric hammock under a mature canopy of bald cypress, tupelo gum, water oak, sweetbay magnolia and tuliptrees that provided a cool (albeit humid) break from the adjacent longleaf pine flatwoods. Boulder, Markee and Shark Tooth Springs emerge from sandhill and scrub communities and their relatively steep slopes provided an interesting transition from sand pine scrub across longleaf pine sandhills into the wetland community created by the springs. This field trip allowed us the opportunity to review the information learned during previous field courses. We discussed the diversity of frogs in wetlands systems across Seminole forest, the need for fire to maintain most of the upland communities in the Wekiva basin and the unique attributes of the ecological communities that we visited during the last year. Hopefully, the FOWR field course provided a primer for some, and deeper insight for others into the benefits and beauty of natural systems in the Wekiva basin.